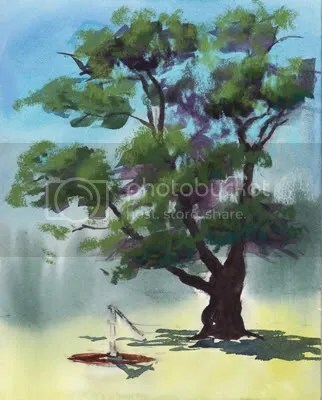 Let’s Paint a Summer Tree! – Let's Paint Nature! Yesterday I visited Papoose Lake in Palos Park, IL., part of Cook County’s protected Forest Preserves. 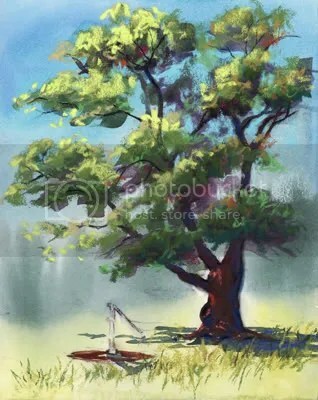 I fell in love with a scene just across the lake; a water spout and an elm tree. Step 1: I am using an Ampersand pastel board because I’m going to get it really wet and I do not want it to buckle in the future. 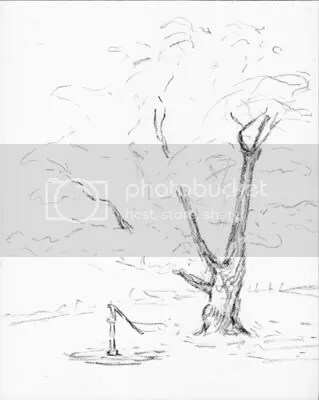 Sketch a rough tree and spout with charcoal. Don’t worry about perfection, just get a shape down and think about composition. My horizon line is 1/3 from the bottom. Step 2: Spray the board with clean water. 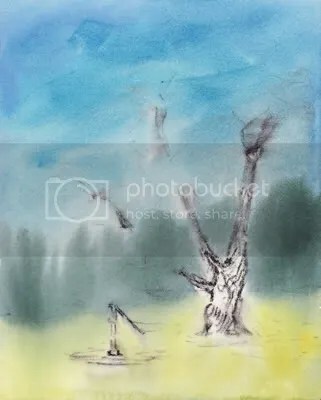 Using watercolors, paint the sky manganese blue, paint the distant trees manganese blue and sap green mix, and paint the grass lemon yellow and a touch of sap green mix. 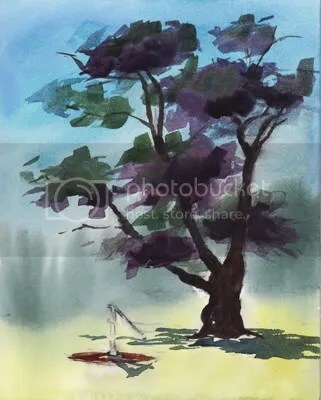 Your watercolors have to be very dark or a strong pigment concentration with less water because the watercolors will dry really, really light. 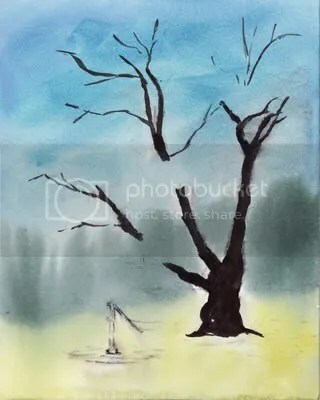 Also, they bleed fast, so just tap the board a little for the distant trees, do not make large sweeping strokes or the trees will bleed and take over in the sky. Keep them in their place. Step 3: When everything is completely dry…(if you have no patience like me, use your hair dryer on the board)…paint the trunk in watercolors. I used a mix of payne’s gray and burnt sienna. I painted the trunk in chunks, leaving space open for leaves. I’m not concerned with how the branches look, I probably will cover most anyway, right now I just want a road map. Step 4: When everything is dry, using watercolors paint leaf cluster shapes. Did you see I said “shapes” not leaves. We are not painting leaves! I think a lot of artists think if I’m painting leaves, they have to look like leaves…NO! We are just getting shape and contrast down. Here I used a watercolor purple mix of alizarin crimson and cobalt blue, and a mix of that purple plus sap green. 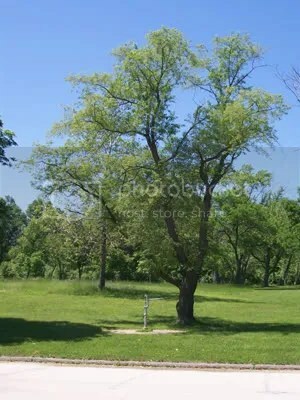 Paint a shadow under the elm tree using payne’s gray and cobalt blue. Under the water pump paint the concrete with a little burnt sienna. Step 5: We are done with watercolors. When everything is dry, using pastels, paint more leaf cluster shapes on top of the watercolor shapes. I used a dark green, and a mid green pastel stick. Don’t cover everything let some purple show through. Step 6: Highlight the leaf cluster shapes with an ochre green and lemon green pastel paint. Keep in mind which direction the sun is coming from. Paint the lightest highlight on the top and left of the tree. For excitement I added a touch of fun colors. Here and there I used an orange pastel just to complement the blue sky. That really makes it pop! Step 7: Using Gioconda soft pastel pencils, or whatever brand pastel pencils you have, re-define some twigs using dark brown or dark blue. Also highlight the bark with some yummy orange colors. That is where the sunlight got through to light up the bark. On the other side of the bark I painted the trunk an electric blue to give it some pop. For the grass, I used various green pastel sticks and held them on their sides to get a nice blade stroke. I didn’t go crazy with the grass, I didn’t want to fill the whole bottom and take the attention away from the tree. Step 8 Final: Using my pastel pencils, I filled in the water spout using various gray shades and a touch of red-brown (there was a little rust on my water pump). Also some blue for shadow. Looks good! I hope you enjoyed this step by step demonstration on how to paint a summer tree. Lana: Thanks girlfriend! and yes, I HATE waiting too..he he he, whatever it takes! U r amazing ! I am from india and newbie in painting.So started with watercolor. Vandyr: Thank you very much, I hope you have fun!!! Keep practicing and you will do great. I must try this. I have not used pastels. So you are using sticks, pencils and pastel paints. Would acrylics work over watercolor?